Chairman and Founder of Alibaba Group Jack Ma indicated his desire to visit Pakistan this year in a meeting with Minister of State for Information Technology and Telecommunication Anusha Rahman. The meeting, which took place on the sidelines of United Nations Conference on Trade and Development (UNCTAD) E-Commerce Week, also discussed the recent developments taking place in IT and Telecom sector in the country. 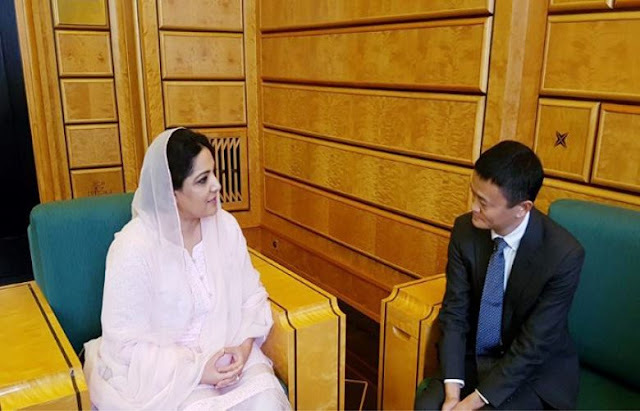 While participating in the E-Commerce Week, Anusha Rahman highlighted the infrastructure in Pakistan that had been put in place in IT and Telecom sector and informed Alibaba Groups Founder on recent developments which have connected more than 40 million people through mobile broadband in the last two years. She also briefed about several initiatives being undertaken for ICT penetration in the country such as “ICT for Girls” programme. Jack Ma lauded the developments in Pakistan in the IT and Telecom sectors. Whilst appreciating the proposal, he agreed to look favourably into it. The chairman of China’s biggest e-commerce portal also showed his desire to visit Pakistan this year and to meet the beneficiary girls of ICT for Girls programme. While speaking at the high-level segment of the occasion, the minister highlighted the ICT infrastructure in Pakistan, in particular broadband connectivity.